I've mentioned before that I am not an idle person...I always have to be doing something with my hands. Since being in Michigan, I've picked up my love of crocheting & knitting again and am getting a real work out. I need to be careful & pace myself otherwise I'll end up with carpal tunnel and that will be no good! Since I went to Renegade & met the wonderful (fellow crocheter) Susanah, I've fallen even more in love with yarn. There is just something so inspiring about finding a fellow individual that loves the same thing as you do! Her designs have a great sense of direction & are just plain lovely! Big Lot's - I remember the first Bit Lot's trip where I discovered they sold tiny skeins of yarn for $1. I nearly fell over backward! It was at this point in time in 2011, that I'd just moved to Williamsburg & needed something crafty to sooth my itch to make. I bough up about 10 or so skeins & set off to make one big granny square blanket. I made sure to buy all the colors I needed up because, with those stores, you'll never know when it will be gone! The hard part was that there was no dye lot. I assume they were just ends of things wrapped together & sold. So I sat in the aisle & pulled out all the skeins that looked to be about the same colors. Jack pot! I recently did this again when I first moved to Michigan & am working (in between other things) on a blanket for our new home! Thrift Stores - This may seem a little gross, but you can get partially used or even unused skeins at some thrift stores. My favorite one back home has grab bags of craft supplies & specific bags of yarn. I've gotten unused skeins of yarn at like 4 for $2! My only suggestion (it's what I do) is to either unravel the whole skien, wrap it around a chair's legs, tie a few strings around it, & wash it OR wash the item you've made with it very well. This was a great penny pinching way for me to boost my stash for hat making. Etsy & Craft Shows - While this isn't an affordable route, in my opinion it is the best one. Why? Because you are supporting individuals with the same passions you have! And you can get super unique skeins you won't find anywhere else. I've bought 2 skeins of hand spun yarn from craft show & have loved them each time. I am working through the yarn in the picture above (bought at Renegade from Biggie) to make myself a hat specifically for the Michigan/Indiana Winter that's coming a long. 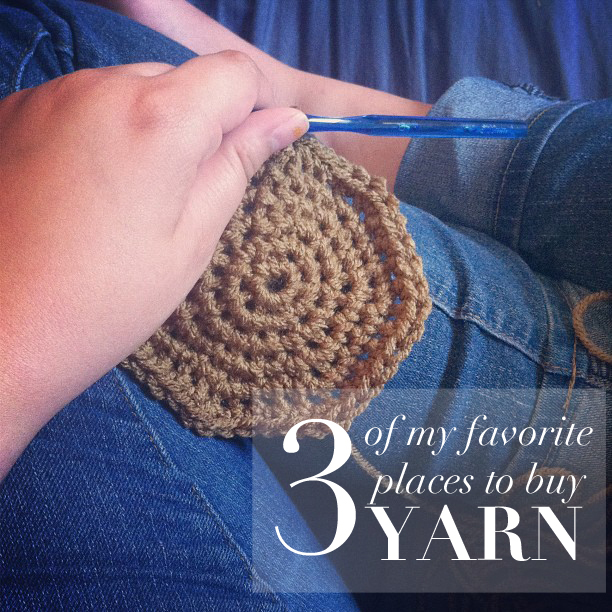 Crocheting & knitting are great hobbies to learn if you're like me and want to make, make, make. They can be intricate & sometimes even mindless. I like to make big crochet granny square blankets because I am doing something, I don't have to pay much attention to it, & I can still watch TV. Sometimes the repetitiveness helps me think up new ideas & it always calms my nerves. If you want to learn either, I'd suggest hitting up YouTube. There are some awesome tutorials out there! Where do you find your favorite craft supplies? Estate sales are great places to pick up wool and i've even seen it in our local Dollar Tree. Although I don't mind using Red Heart wool - and their range of colours is amazing, I find it a lot thicker then I'm use to in comparison to the UK wool of that kind. Sometimes I think it's a little better just to pay that little extra and go for the Caron extra soft wool. Big Lots sell yarn??? I must not be paying attention, I gotta look into this the next time I go. :) I need a TON of yarn for this coming holiday season and I'm kinda procrastinating.